Starting this fall, several young people who lack legal status will be able to attend a university in Illinois thanks to the efforts and generosity of some of its students. Students at Loyola University Chicago voted last year not only to establish a scholarship fund for undocumented students, but also to fund it themselves. They agreed to pay an individual student fee of $2.50 each semester to help fundraise an estimated $50,000 for the Magis Scholarship Fund. Don Graham, one of the founders of TheDream.US, a national scholarship fund for DACA recipients, matched the student's contributions by donating $50,000 to the fund last year. 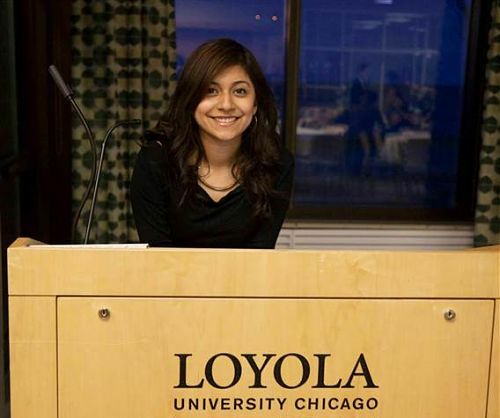 Adriana Robles, a senior at Loyola American Student Organization, was one of the driving forces behind the creation of the Magis Scholarship Fund. The Magis Scholarship Fund, which the university's board of trustees agreed to implement in December, will give out scholarships to undocumented students who've been approved for Deferred Action for Childhood Arrivals, a federal program that allows recipients to stay and work in the United States. Adriana Robles, one of the Loyola students who advocated for the creation of the Magis Scholarship Fund, said she was shocked to see how many students voted in favor of creating the scholarship fund. She said about 70 percent of the students voted in support. "It made sense to them to support students who couldn't access financial aid just because of their legal status," Robles said. "They agreed that although education is expensive, everyone should have a right for an education." In Illinois, undocumented students are able to pay in-state tuition but are barred from accessing federal financial aid. DACA recipients who are incoming freshmen or are transfer students and have been admitted to Loyola University Chicago for the fall 2016 semester can already apply for the scholarship. The deadline to apply for freshmen is March 4 and for transfer students it's May 2. Five scholarships will be awarded this year. The scholarship covers tuition, on campus room and board and mandatory student fees for a year. Recipients can apply to renew it for three additional years. The Latin American Student Organization, which Robles is a part of, and the Student Government of Loyola Chicago spearheaded the effort to make the scholarship fund possible. For more than a year, they did classroom visits and set up tables around campus to educate students about the struggles undocumented students face to pay for college. They also created a logo and a social media campaign to raise awareness of the scholarship fund. For Robles, the issue is personal. She said she has friends who are undocumented and has seen how difficult it has been for them to pay for college. She also explained that the word magis means "more" in Latin. Adriana Robles and Flavio Bravo were part of a group of students who helped make the Magis Scholarship Fund possible last year. 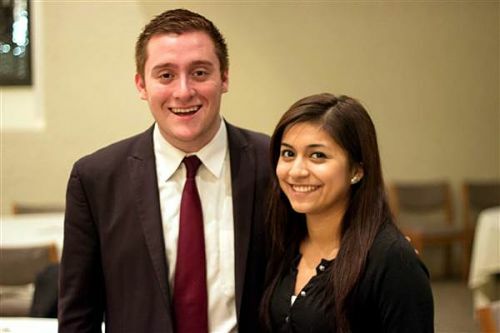 At the time, Robles was the president of the Latino American Student Organization and Bravo was the student body president. "The reason why we wanted to call the scholarship fund magis was because we believe Loyola students want to do more for other students," she said. Loyola University Chicago is one of the largest Jesuit, Catholic universities in the country, with nearly 16,500 students attending. Jesuit schools are committed to "the service of faith and the promotion of justice." This is not the first time Loyola University Chicago does something to support undocumented students. This past fall, the university awarded five full ride scholarships to DACA recipients. And in 2014, Loyola's Stritch School of Medicine became the first medical school in the country to admit DACA recipients. A total of 20 DACA recipients are currently enrolled in the medical school. John Pelissero, the interim president for Loyola University Chicago, recently stated that the implementation of the Magis Scholarship Fund is one of the latest ways the university is "showing our commitment to students, regardless of their status." "As a Catholic, Jesuit institution, we have a responsibility to do more for our students, specifically those who are marginalized in our communities," he said.